With its versatile performance capabilities and proven use in a broad range of applications, Duratron polyamide-imide (PAI) shapes are offered in extruded and compression moulded grades. For high temperature applications, this advanced material offers an excellent combination of mechanical performance and dimensional stability. Duratron PAI is the highest performing, melt processable plastic. It has superior resistance to elevated temperatures. It is capable of performing under severe stress conditions at continuous temperatures to 260 °C (500 °F). Parts machined from Duratron stock shapes provide greater compressive strength and higher impact resistance than most advanced engineering plastics. Duratron PAI's extremely low coefficient of linear thermal expansion and high creep resistance deliver excellent dimensional stability over its entire service range. 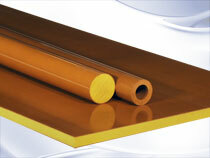 Duratron PAI is an amorphous material with a Tg (glass transition temperature) of 280 °C (537 °F). Duratron T4203 PAI (colour: yellow-ochre) offers excellent compressive strength and the highest elongation of the Duratron PAI grades. It also provides electrical insulation and exceptional impact strength. This grade is commonly used for electrical connectors and insulators due to its high dielectric strength. Its ability to carry high loads over a broad temperature range makes it good for structural components such as linkages and seal rings. Duratron T4203 PAI is also an excellent choice for wear applications involving impact loading and abrasive wear. This grade (colour: yellow-ochre) is commonly used for dies and patterns of formed metal parts or as thermal insulators. It is similar in composition to Duratron T4203 PAI, and selected when larger shapes are required. The addition of PTFE and graphite provides higher wear resistance and lower coefficient of friction compared to the unfilled grade as well as a lower tendency to stick-slip. Duratron T4301 PAI (colour: black) also offers excellent dimensional stability over a wide temperature range. This extruded Duratron PAI grade excels in severe wear applications such as non-lubricated bearings, seals, bearing cages and reciprocating compressor parts. 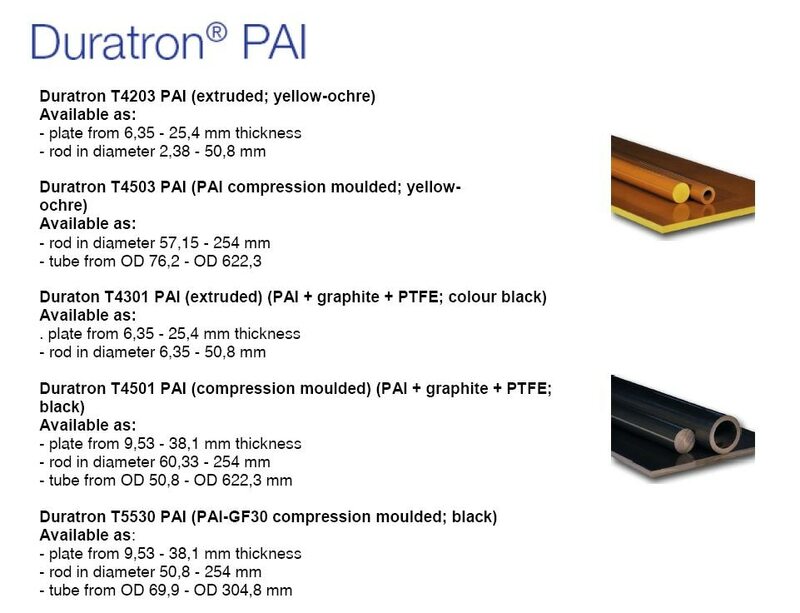 Compression moulded Duratron T4501 PAI is similar in composition to DuratronT4301 PAI, and is selected when larger shapes are required. Duratron T4501 PAI (colour: black) is well suited for general purpose wear and friction parts. It has a high compressive strength and can therefore carry more load. It is similar in composition to Duratron T4301 PAl, and selected when larger shapes are required. This 30% glass fiber reinforced grade (colour: black) offers higher stiffness, strength and creep resistance than the other Duratron PAI grades. It is well suited for structural applications supporting static loads for long periods of time at high temperatures. In addition, Duratron T5530 PAI exhibits superb dimensional stability up to 260°C making it extremely popular for precision parts in e.g. the electronical and semiconductor industries. The suitability of Duratron T5530 PAI for sliding parts, however, is to be carefully examined since the glass fibers tend to abrade the mating surface. As Duratron PAI has a relatively high moisture absorption rate (see Figure 24), parts used in high temperature service or made to tight tolerances should be kept dry prior to installation. Thermal shock resulting in deformation can occur if moisture laden parts are rapidly exposed to temperatures above 205 °C (400 °F).